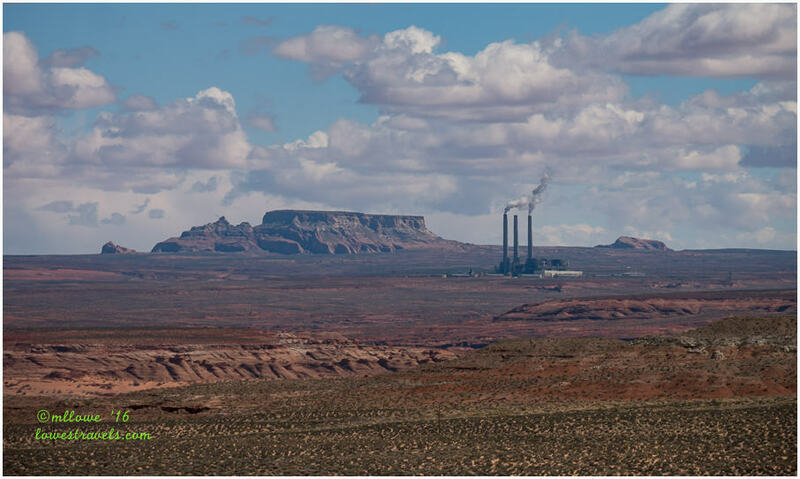 While perusing my recent photos I realized I’d overlooked some activities we enjoyed along scenic US 89 near the Utah state line while camping in Page, AZ. 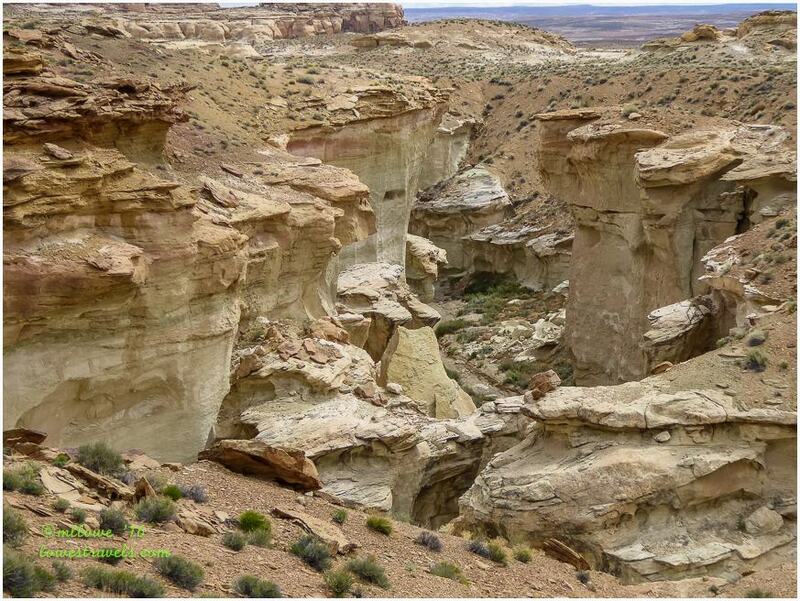 There are two accessible areas of the Grand Staircase-Escalante National Monument between Kanab and Page. Folks who enjoyed my Lower Antelope Canyon photos (click here to see them) might also like the ones I took in this area. We learned about this road from John and Pam, and Dave and Sue, who explored it a week ahead of us. 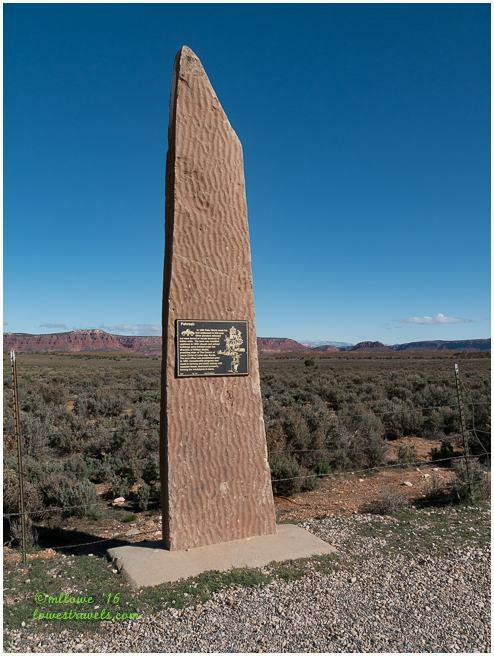 It leads to the remains of Pahreah townsite and descends from the junction with US 89 (milepost 31) into a valley. 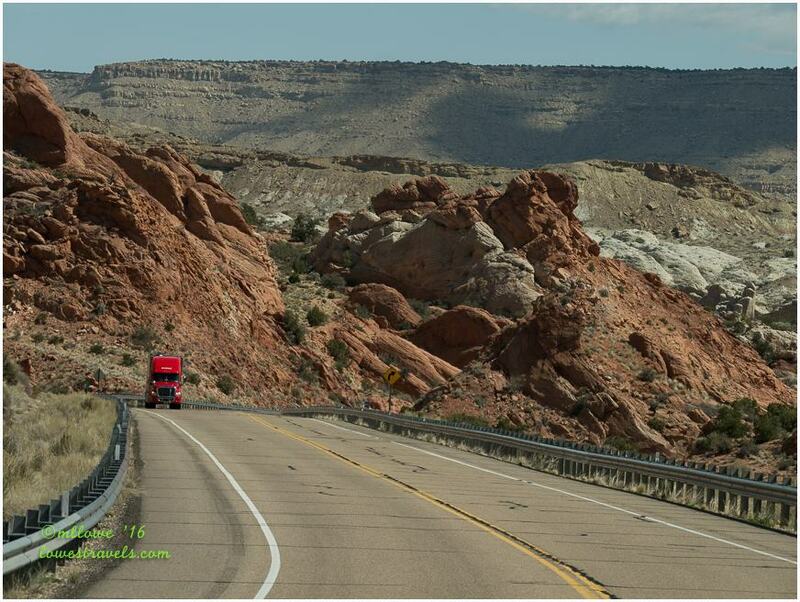 The road becomes steep and twisting near the end, as it crosses the undulating banded hills that cover the area. 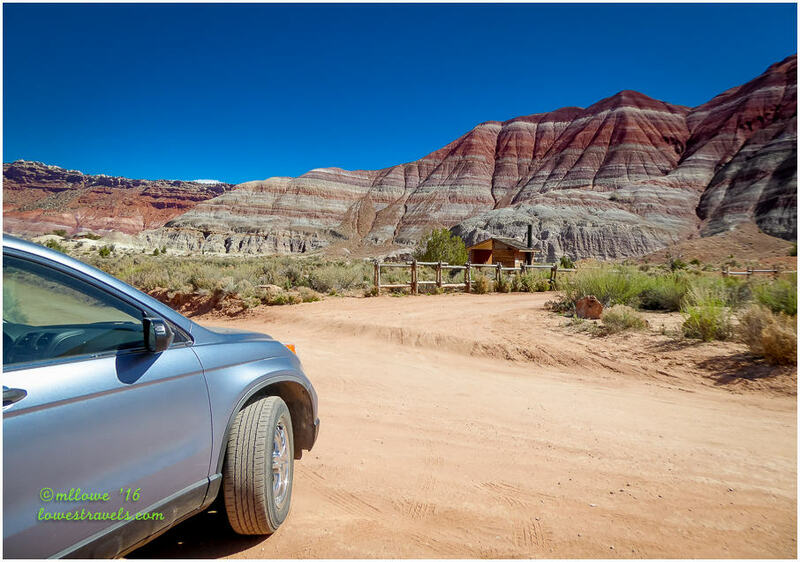 Our Honda CRV survived the 12-mile roundtrip drive, but it was a long haul and we realized that 4-wheel drive would be required if the road were muddy. 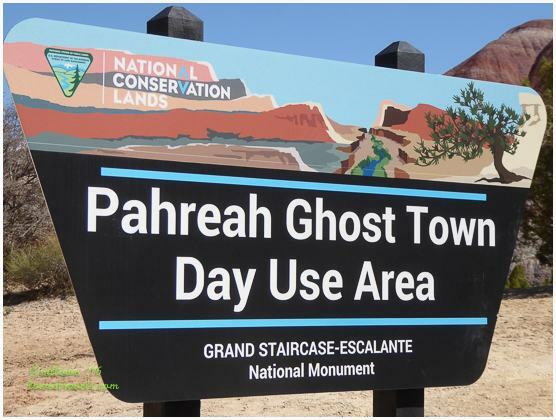 The original Pahreah townsite is located just across the river, but none of the structures remain. The settlement was established in 1869 and subsequently abandoned 40 years later due to frequent river flooding. 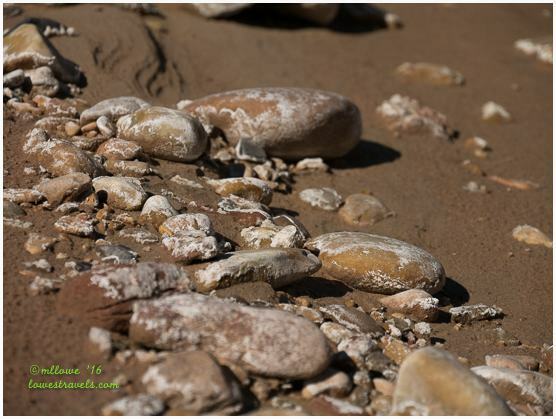 The river flows along a wide valley and is often dry during the summer, and covered in places by an extensive plain of white salt crystals. The crystals result when the floodwaters recede and then evaporate. 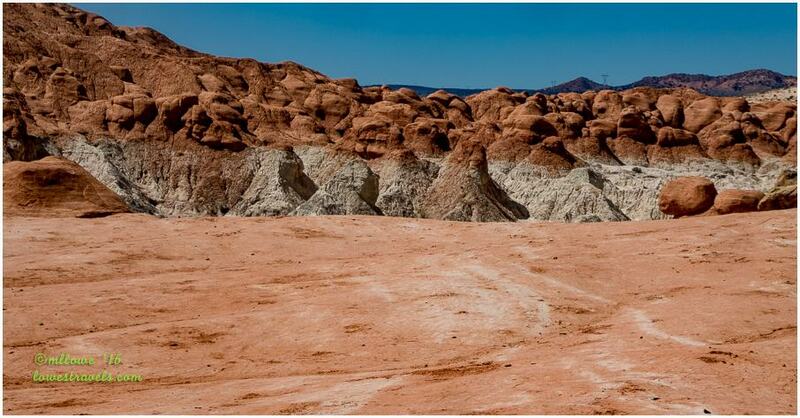 There also used to be a movie set here, located at the bottom of a multi-colored sandstone canyon. Western movies and TV shows were filmed between 1963-1991, but floods and vandalism took their toll and the set was abandoned. 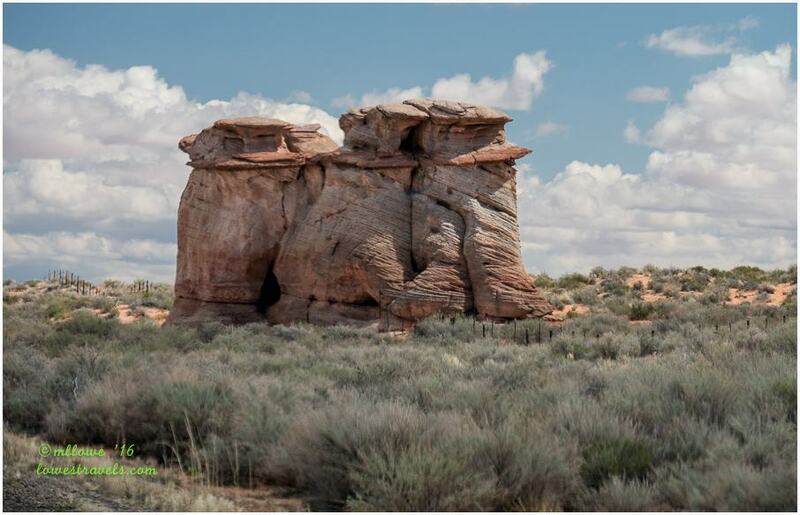 The area is surrounded by amazingly colorful rocks. The cliffs at either side are equally layered and multi-colored, with alternating red, white, purple and grayish-blue strata. 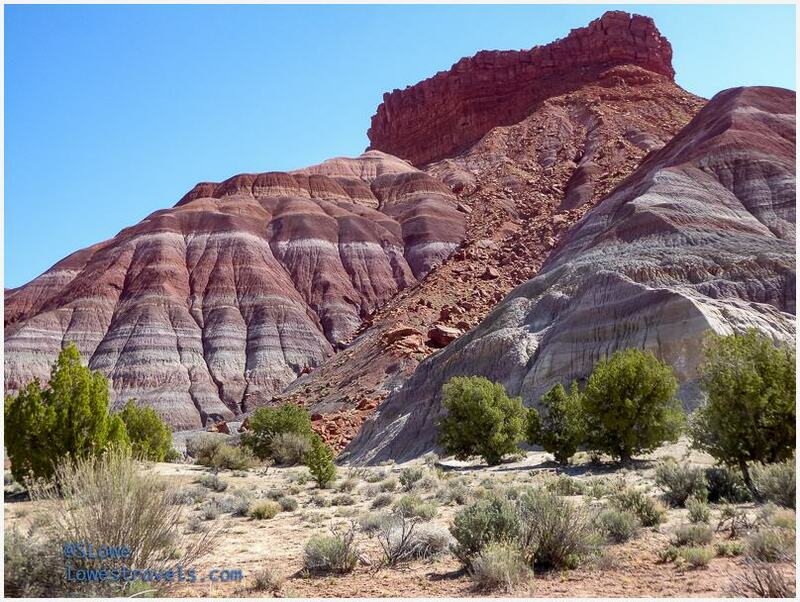 A Petrified Forest Member of the Chinle Formation, this fascinating place reminded me of the Painted Desert National Park in Arizona. 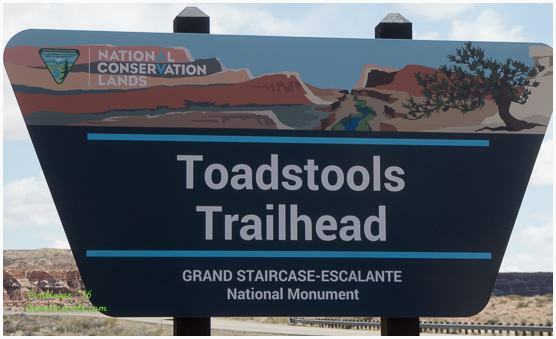 Also along US 89 and within the Grand Staircase-Escalante National Monument was the Toadstool Trail. 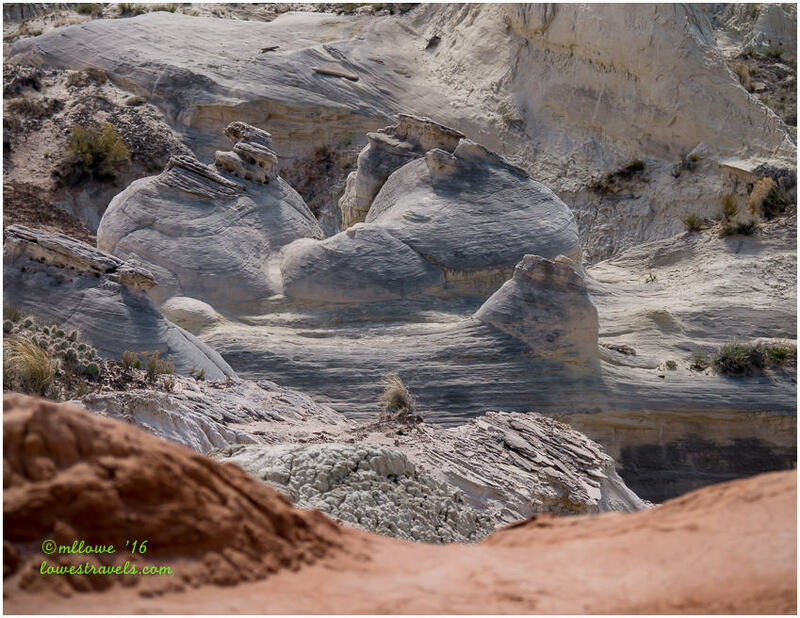 We followed the short .8 mile trail that led into an area of unusual rock formations known as toadstools, hoodoos, goblins or mushrooms. Don’t they look like goblins? 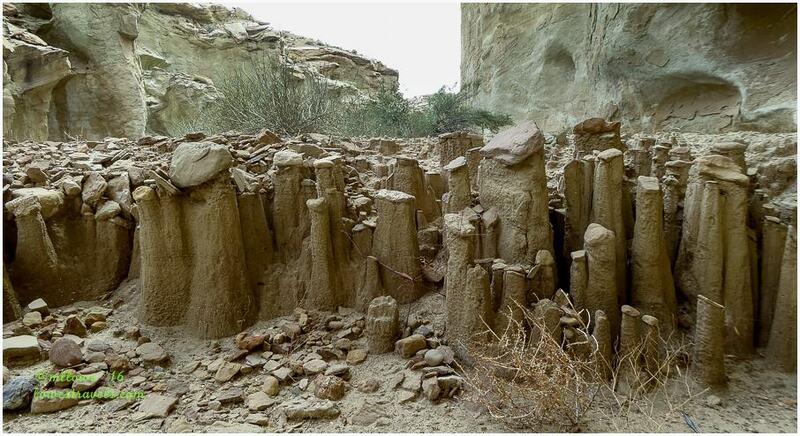 I don’t know about you, but we think these are some pretty cool formations and agree with our friends that they are definitely worth a visit. 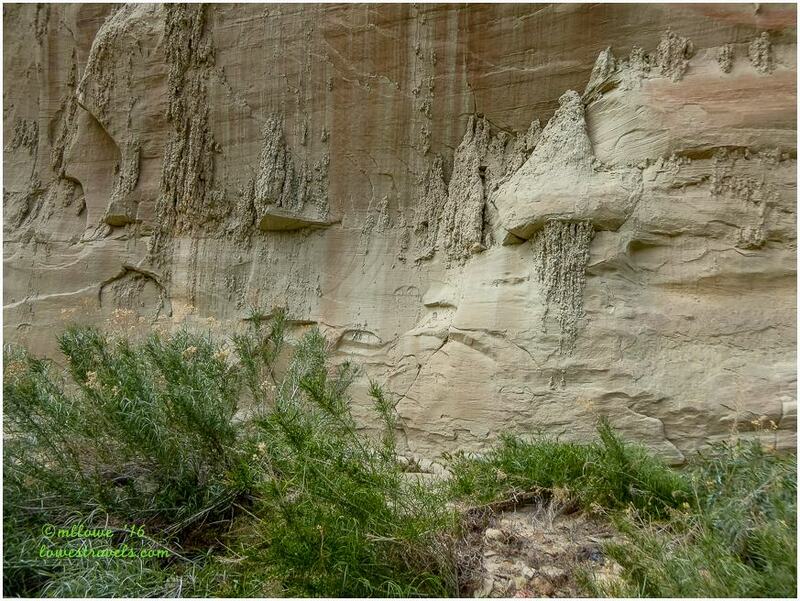 Our reliable hiking tipster, Pam, suggested we would enjoy the 6-mile Wiregrass Canyon Trail, which is located 12 miles north of Page off US 89. So on our last day in town we tackled the trail that took us into Wiregrass Canyon, a steep-sided wash that leads down to Lake Powell (although we didn’t go that far). 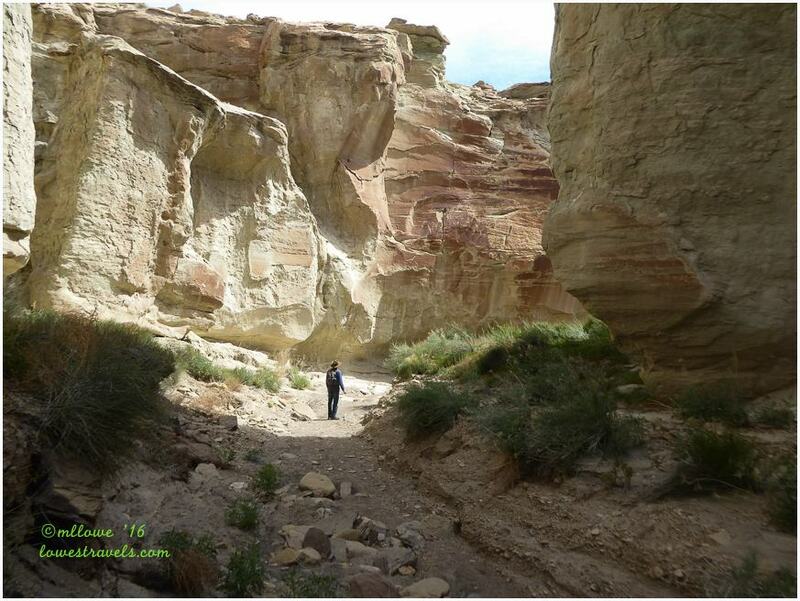 We did some scrambling up and down pour off’s and hiked through the wash between multi-colored sandstone. This might be the second bridge (or arch) Pam was looking for? 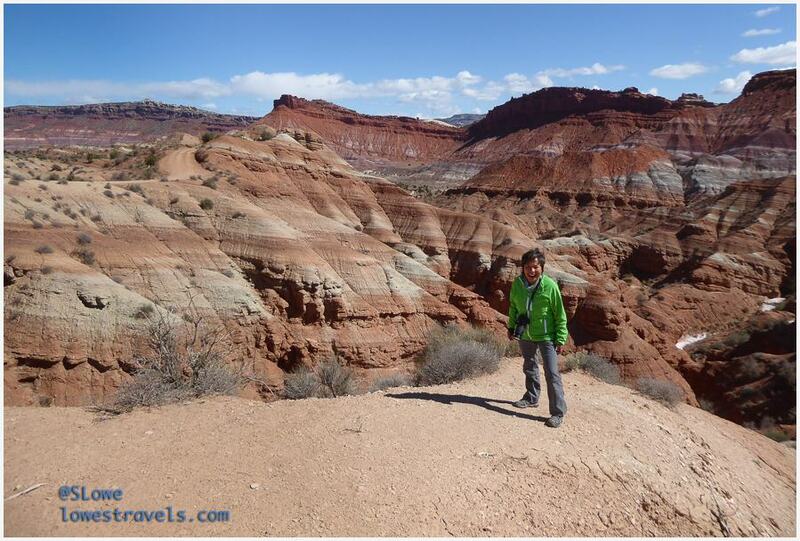 This was a great hike, with fascinating exposed geologic formations. 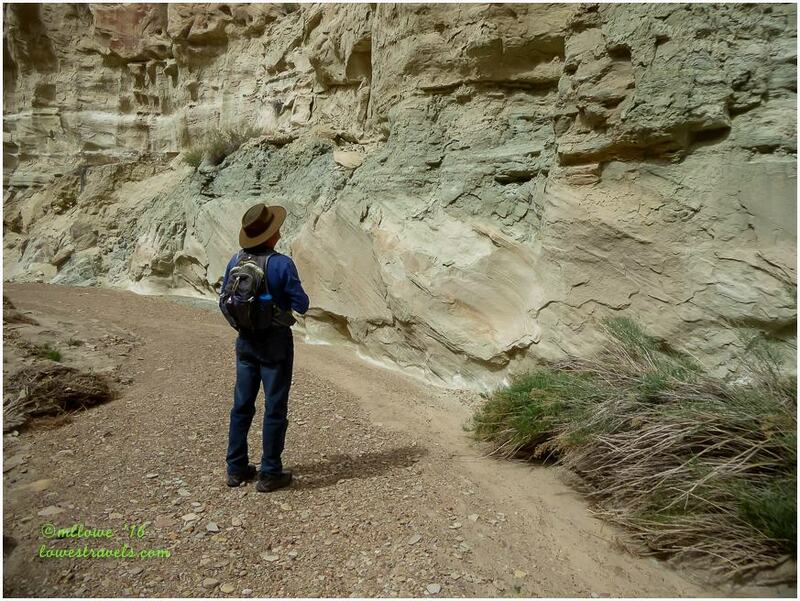 We find that canyon hikes always display different geology, colors and formations that make each one unique and interesting, and we never get tired of them. Especially in Utah! 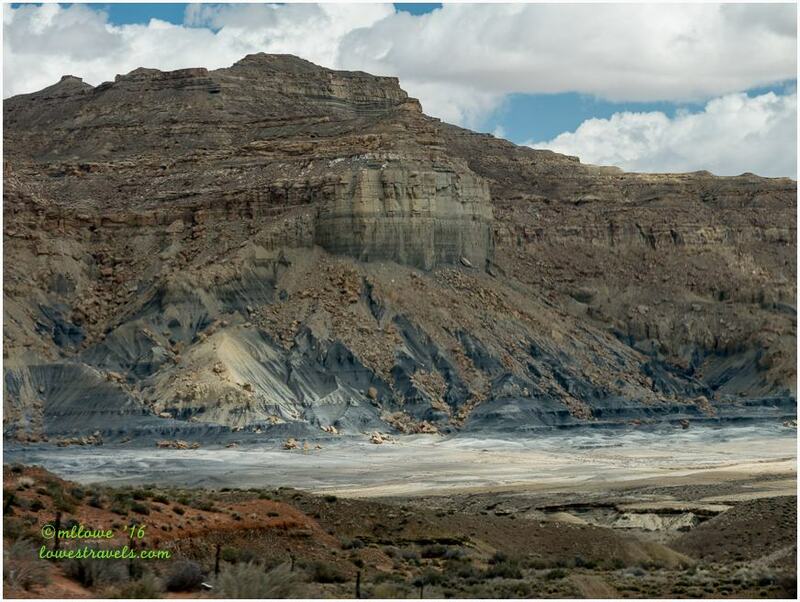 This area between southwest Utah and northern Arizona is incredibly geologically diverse. There’s so much to explore here that we’re hoping to make it back next year. So beautiful … more words are unnecessary. Gorgeous…as only UT can be! Love the final shot of you two! What a gorgeous area! The colors of the rocks are just amazing. We’ll be there in a few weeks and will be referring to your blog (of course!). 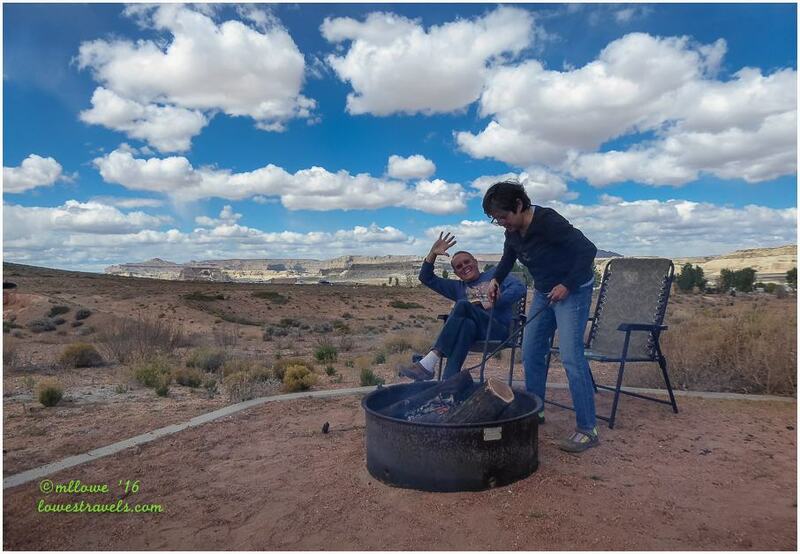 Love that last photo of you two relaxing by the fire. Looks like you had a wonderful view from your site. Wonder how our big truck would do ob the drive to the old town site. The toadstools are on our list of places to see though I think we may have been there before but with out a blog back then I just can’t remember. Steve says your truck can definitely make it. This is a spectacular area! We can’t wait to return and do some more hiking in areas we missed. 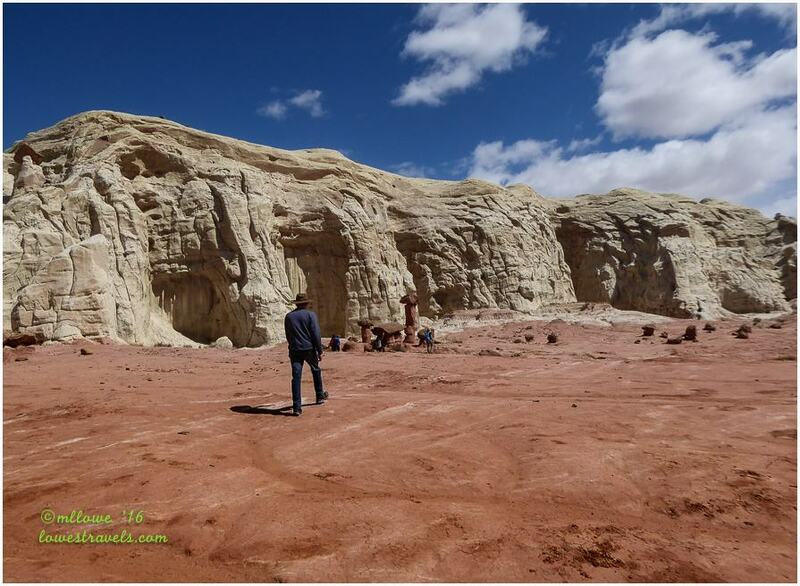 Glad we all got see the Paria site. The hills were some of the most beautiful we’ve ever seen. The colors were so vibrant. Sure hope to explore this unique area one day. 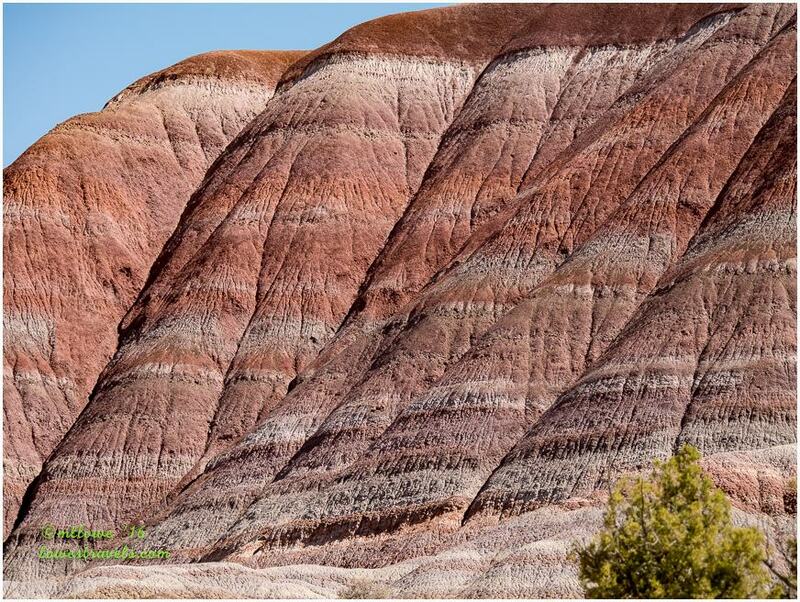 You are right, those banded hills remind me of the painted desert too. Sorry to hear that your CRV wouldn’t make it if it were muddy at all. I keep thinking I could get a CRV and have great 4WD. Really beautiful pictures of the wonderful trails. Love the mini hoodos. So much to see in that area. 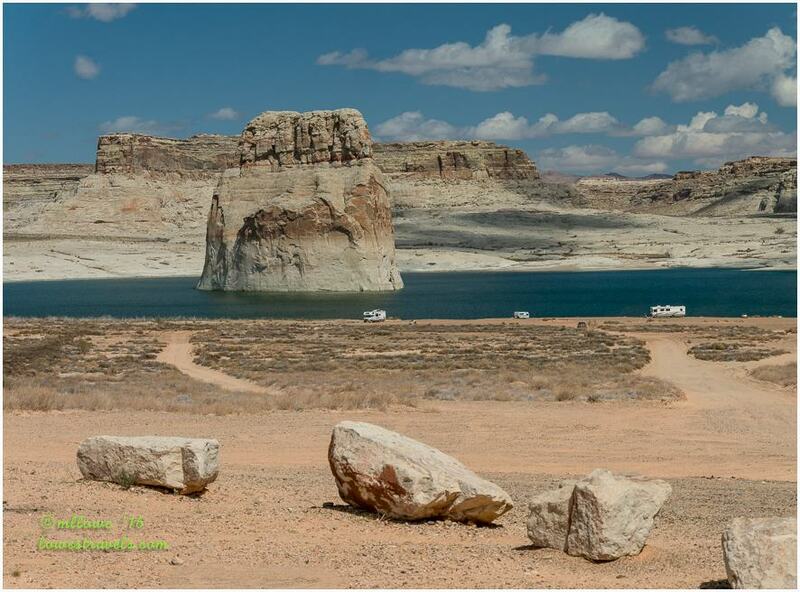 I can only wonder what Lone Rock looked like before the dam. Terrific last picture of you two. Safe travels.